So long as your roof is adequately aligned and relatively free of shade, do it. Not only will you save money in the long run, the feeling is great. I’ve been concerned about climate change for nearly two decades and troubled that our country seems so backwards in addressing it relative to other countries. For example, Germany’s financial incentives have put solar on so many rooftops that on some sunny days, the country produces more power from residential solar than it can use! 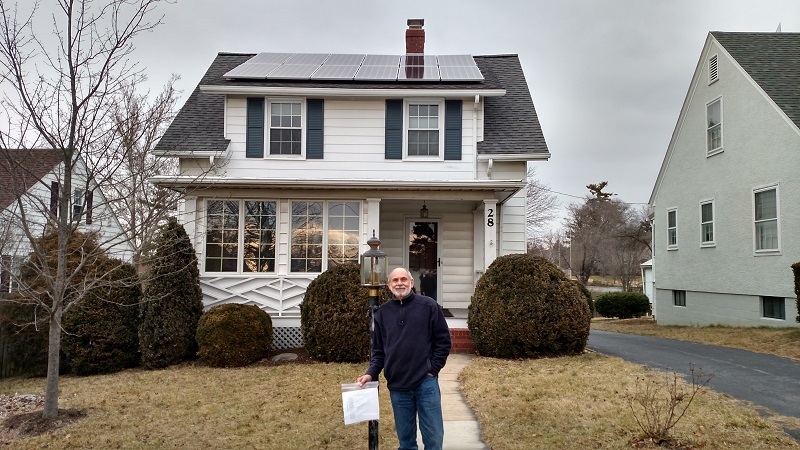 In 2012 I looked into putting solar on our home and just couldn’t make the finances work on our budget. What a difference two years made. In 2014 it was well within reach for two reasons: 1) the price of panels had come down significantly, and 2) the emergence of co-ops streamlined the process and further reduced the costs through economies of scale. Oh, yes. How easy it was through the co-op. The exploratory meeting for the co-op took place in April 2014 at the Massanutten Regional Library in Harrisonburg. From there things took off like wildfire. More than 100 families expressed interest, bids were put out, an installer was selected (Sigora) by a co-op committee, and installations began before the end of the year. Just over six months from novel idea to fulfillment. Do you have any data on your solar system’s performance? What electricity saving have you experienced since going solar? Our array provides about 85% of our electrical needs and has reduced our electric bill from about $700 annually to about $100. We also get a few bucks back from SRECs (solar renewable energy credits). We’ve generated nearly 14 megawatt hours (MWH) since installation, about 5.2 MWH annually as shown in the graph below. Our system will pay for itself in about eight years. For the remaining 22 years of expected life, our juice is essentially free. What advice would you give to someone is considering going solar? So long as your roof is adequately aligned and relatively free of shade, do it. Not only will you save money in the long run, the feeling is great. And by having panels, you will encourage your neighbors to do likewise.